Singer Kim Hyun-joong, who will release his first solo album entitled "Break Down", said, "Bae Yong Joon gave me positive advice on my album". Singer Kim Hyun-joong, who debuted as a solo singer by releasing his first solo album entitled "Break Down", held a press conference and a showcase at Jang Choong Gymnasium on June 7 and expressed his feelings. He introduced the concept of his new album, saying, "I am 26 years old in Korean age and it is still young to be classified as a grown-up man. I am actually not a type of macho man, but I just wanted to present a difference appearance not as an idol but as a man". He had already experienced album production when he was a member of a group and he also participated in producing his album this time. He explained, "I visited America last year in June to find out my own songs, and I actively presented my own opinion when creating a dance performance and making a music video. I have tried to deviate from my previous image in SS501 and tried to improve my performance and make the impact of the performance much stronger. I wanted to be evaluated as 'He is a real man' and 'He can sing a mature song'." As he already explained, his title song "Break Down" is a dynamic dance song with a strong beat and sound focusing on Kim Hyun-joong's splendid dance performance. Rapper Double K participated as a featured artist. Kim continued to explain his album, saying, "People might have been curious about Kim Hyun-joong's style in the first solo album. When I chose the title song, I agonized between 'Break Down' and 'Please', and I chose 'Break Down' because I want to present a cool dance performance in the hot Summer. Romantic songs with sweet lyrics such as 'Kiss Kiss' are also included in my album". 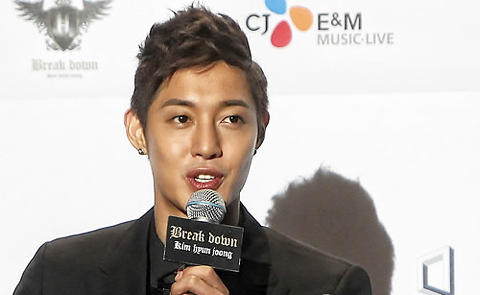 The music video for the title song was unveiled during the showcase, and it also revealed Kim Hyun-joong's strong image. He appeared as a muscular man with a dark and powerful image in the music video. Kim Hyun-joong said, "I made a promise with my physical trainer to work out for 100 days, and I became very nervous when 50 and 70 days passed, so I worked really hard since then. I also trained to strengthen my physical ability for a better performance as a solo singer while working out and playing soccer". The fact that his album was the first album since he had moved to his new agency Keyeast, in which Hallyu star Bae Yong Joon is the largest shareholder, raised more anticipation. Kim said, "Bae Yong Joon suggested I study music more, taking this chance, and he had showed any good music or dance video he came across to me. He actively supported my album production by checking videos filming my dance performance. And Bae, who has a talent in taking pictures, suggested shooting my album jacket photo. He seemed to study producing music albums as a representative of an agency. I really appreciated his advice and I am also very satisfied with the support from my agency". Among the members of SS501, he was the fourth member who came to debut as a solo singer. He frankly revealed that he was feeling pressure, saying, "When I looked at the other members who debuted as a solo singer, I realized that the title of "former member of SS501" could not gurantee an easy way as a solo singer. I had to do everything by myself, and I tried to overcome myself with more practice whenever I felt difficulties. I had poor breathing and pronunciation, so I practiced reading books and newspapers while biting a cork in my mouth, and I could hit notes that I could not hit before by practicing". He mentioned Seo Tai Ji as his role model. He said, "Even though he sang different genre songs from me, he is still my role model as a singer. As for actors, there are many actors whom I respect, but now the actor Sol Kyung-gu, who is living in the flat below me, suddenly comes up into my head". With the showcase held on the same day, he began his activities as a solo singer in earnest. Kim said, "Jang Choong Gymnasium will go through remodeling, and I will be the last singer who performs in this place before the remodeling. I will present a splendid performance during my showcase". He revealed confidence and talked about his future plans, saying, "After I moved to my new agency, I had not held many performances, so I will actively perform at home and abroad from now on. I will begin holding fan meetings from August in Asian countries, and I will hold an Asia concert tour after I release my second album at the end of September. I have already begun working on my next album. You will be able to see my activities more as a singer and not as an actor this year".